The archaeological site of Kadhima (Kāẓimah) is located on the coastal plain at the western end of Kuwait Bay. The name Kadhima is well known from early Islamic historical sources but no archaeological evidence for activity in the area had come to light until the discovery of Umayyad and Abbasid pottery, coins and structural remains in 2002 by Sultan al-Duwīsh. As is common in early Islamic history, the most important sources to mention Kāẓimah date from the 9th,10th and 11th centuries. The name seems to refer to a specific settlement area associated with wells and to a larger region along the coast. The scattered references to Kāẓimah suggest it was a well-known place, with water and a fort, that was located on a route connecting Iraq to parts of the Arabian peninsula. As one of the few very early Islamic sites known in eastern Arabia – or indeed in the whole of Arabia - Kadhima has the potential to inform our understanding of the Islamic world during its formative period. Unfortunately, the site is also at risk of destruction, with the long-term processes of wind erosion and surface deflation accelerated by the immediate dangers of stone-robbing and human damage. The Kadhima Project was therefore initiated by the National Council of Culture, Arts and Letters of Kuwait in collaboration with Durham University and the National Museum of Kuwait. The first season of research took place from mid December 2009 to mid January 2010, with a programme of site recording, surface collection and landscape survey. The project is taking a dual approach in considering both settlements and their wider landscape and area context. The emerging picture is of a number of small settlements dispersed along two kilometres of the coastal plain, evidenced by rough stone buildings surrounded by scatters of shell, pottery, glass, and chlorite. 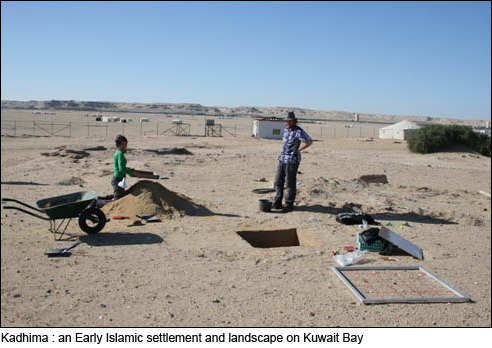 Work conducted so far suggests that occupation at the site and activity in the landscape at Kadhima can be primarily dated to the Early Islamic period. While a thin possible Neolithic, Bronze Age and Parthian presence was identified, the majority of pre-Modern material dates to the 8th (perhaps also 7th ) century AD. The general absence of any Samarra horizon wares indicates that the site must have been abandoned by the early-9th century AD, and there is little evidence for use of the landscape beyond passing nomadic groups in the pre-Modern period. The Early Islamic site is itself small and dispersed, but appears to reflect relatively intense activity and occupation compared to both the surrounding landscape and - perhaps more significantly - to earlier and later periods. Many potential reasons might be found for occupation in this particular location, including the availability of water and marine resources, and the potential for transport and trade between southern Iraq, Iran and the Arabian Peninsula, by both land and sea but none of these help to explain why the 8th century should have been a period of such marked activity in this particular area. The reasons for this may need to be sought more widely. It is already becoming clear that the 8th century was a period of considerable growth and development across Eastern Arabia when sites such as al-Qusur, Sir Bani Yas, Hulaylah and a number of smaller sites first come into existence. It is therefore possible that the activity at Kadhima may simply be a local manifestation of a wider regional pattern.